Don Hawkins AIA (architect and historian) and Catherine Nagel (Executive Director, City Parks Alliance and National Association for Olmsted Parks) were the moderators of this event. The workshop began with an abbreviated PowerPoint chronology of the development of the Mall, the Evolving "Sacred Precinct." While the Mall as we know it today seems to be molded in a tradition of Renaissance formality, there remains a strong humanistic underpinning originally given it by Pierre LEnfant in his 1791 plan for the nations capital. LEnfant celebrated the newly formed constitutional structure of a separated Executive and Legislature, and set the city gracefully in a bowl tipped towards the Potomac River surrounded by low hills which formed visual boundaries for the new city. At the core of LEnfants plan was the location of the Capitol on the high ground, a mile-long broad avenue tying it to the Presidents House, and two lineal open spaces, one opening west from the Capitol, and the second opening to the south from the Presidents House. At the intersection of these two vistas, he placed a memorial to the first President, for whom the city was named. Todays Mall is the descendent of the LEnfant concept of a tree-lined pedestrian boulevard framed by cultural and diplomatic structures. The McMillan plan of 1901-02 converted the Mall -- which by the turn of the century had been developed in the romantic landscape tradition -- into a formal Beaux Arts composition, a complete work of art and an idea which rapidly captured the national enthusiasm for grandeur. The length of the Mall was doubled by incorporating part of the reclaimed tidal flats of the Potomac. The ideas for improving the north-south cross axis never fully materialized. But the Mall we know today did not develop easily, or without significant changes. The terminal feature at the west end, envisioned at one time by architect Daniel Burnham as the memorial to General/President Grant, became the Lincoln Memorial, and the terminal feature at the south end, envisioned as a memorial to heroes of the Revolution or to Theodore Roosevelt, languished and eventually became the Jefferson Memorial. Many of the landscape features proposed by the McMillan design team also fell be the wayside, particularly the elaborate garden setting for the Washington Monument. Nonetheless, the McMillan Plan guided the development for close to a century, a testimony to its design excellence and political timeliness. While throughout the 19th and early 20th Centuries the Mall was occasionally used as the site for major exhibitions and protests, in the mid 20th century it became the focal point for the civil rights and anti-war movements. The Lincoln Memorial, originally dedicated to the preservation of the union took on an additional layer of meaning as the shrine of the Great Emancipator, the site for major civil rights events. In 1965 the NPS retained SOM (Skidmore, Owings & Merrill) to prepare an updated Master Plan for the Mall. This plan attempted to guide development and restore the Malls formal monumentality, while also attempting to lessen the impact of increasing automobile traffic congestion by burying some of the Malls cross streets. The 1997 NCPC Legacy Plan -- which started out as an effort to locate sites for new memorials -- tried to extend the monumentality of the Mall into the city by re-envisioning North and South Capitol Streets as grand avenues. One of the criticisms of this plan is that it did not deal adequately with the reality of the Capital City at the end of the 20th Century. 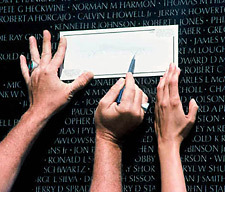 During the 1980s another phenomena was burgeoning, an era of new memorials unleashed by the construction and success of the Vietnam Veterans Memorial, and rapidly followed by the FDR Memorial, the Korean War Veterans Memorial, and finally the WWII Memorial. At the end of the 20th Century, NCPC proposed, and Congress endorsed, the creation of a "Reserve" for the core area of the Mall, and declared a moratorium on any new memorial, museum, or visitor centers. Congress, following NCPC, declared the Mall a substantially "completed work of civic art". Thus the increasingly crowded, but vibrant, Mall -- "the peoples front lawn" -- was destined to become a museum. Lost in this act was the basic concept of continuous adaptation which had marked the Malls first two centuries. With this preamble, the participants in the workshop began their discussion of the implications of this planning history for meeting todays problems. 1. WHAT DOES THE MALL MEAN TO AMERICANS? The Mall means many things: vistas and openness, places for recreation and education, sites for gatherings and protests, memorializing and remembering. But the more fundamental purpose of the Mall is to express in landscape, our ideals, freedom, and the institutions of democracy. The recent development of a series of veterans and war memorials has moved the balance of meaning towards signifying war as the core purpose of our democracy. War memorials are intransigent, but as generations pass, their relevance fades unless they somehow speak to core values. To be suitable for placement on the Mall, a new project must reach to express the fundamental purposes of the core values enshrined there. It is public usage, not physical planning, that has endowed the Mall with the strong emotional content which is so keenly felt today. The McMillan Plan, inspired by Versailles and other European models, has been Americanized. Visitors often feel that they own the Mall. In peoples minds, the Mall includes the surrounding buildings, not just the open green allée. The museums add a sense of being Americas Attic; the adjacent government bureaus and departments are tangible evidence of the sometimes faceless federal bureaucracy, our democracy at work. The Mall can never be a "completed work of civic art". Our democracy will continue to change, to evolve. The Mall will continue to be the gathering place for Americans to meet, celebrate and protest. It will change too in response to its usage. 2. HAS THE TIME COME TO EXPAND THE PHYSICAL DIMENSIONS OF THE MALL? The design premise of the original Mall was to express, in landscape, the core principles, as well as the grandeur, of our democracy. The McMillan Plan expanded the original vision by enlarging the Malls boundaries as well as the history told there, while also increasing the parkland dedicated to recreation. The major change in the meaning of the Mall in the 20th century has been the evolution from openness and grandeur to collective emotional content. If the Mall is to grow beyond its existing borders, the obvious places for physical expansion are East and West Potomac Park. How can the Malls emotional charge be put into these areas? Perhaps other areas -- North and South Capitol Streets, or the Anacostia Waterfront -- could participate meaningfully in projecting these core principles. 3. HOW IS THE MALL TO BE USED? Workshop participants responded to the explosion of memorials on the Mall in recent years with many strong comments about how they have cluttered the physical landscape, affected public uses of the open space. They questioned whether the Mall should be used for future memorials. "Weve moved from celebrating our values to memorializing war." noted one person. This is the underlying cause for the Congressional moratorium. Do we wish to stop all memorials or should we re-frame them, creating criteria or guidelines that would put existing and future memorials, and their programs, in a context of the larger core principles? Some questioned how existing memorials could be "redeemed" to allow more interaction and not be isolated objects in the landscape. How could we designate their public use? This has already happened with some memorials. The Lincoln Memorial, for example, memorializes a person who united the country to preserve the union, but it also has become an icon for the civil rights movement. It has served as a stage for innumerable gatherings. The temple form, and the grand flight of stairs, seems to work well for both uses. And there is the Vietnam Veterans Memorial, which points to the larger issue of the tragic fracture of credibility between our nations leaders and our youth, but which has, to date, been used largely as a funerary experience. Current Park Service policy is to erect chain fences to mark off the "sacred" zone around this Memorial (and other veterans memorials) and restrict public access and movement. However, this large amphitheater shaped open space might be used selectively and appropriately for occasional services, concerts or ceremonies that could broaden the memorials meaning and use. In the process, a variety of public uses could refresh the honor and memory due to those who fell in that tragic conflict. Policy shifts to permit  and even encourage  such uses would allow us to realize the potential of each memorial for living activity. The suggestion was made of another way of controlling clutter: designating portions of the open space for specific uses -- think of Hyde Park corner in London. An example of such thinking might be to consider the secondary axis of the Mall system, the north-south vista from the White House. The original designation of the area adjoining the White House grounds on the south was "the Presidents Park." Now known as the Ellipse, this area has in recent years served mainly as a discrete parking area for government employees, and a site for the annual National Christmas Tree and pageant. This space might be re-designated as a memorial to the Presidency and made the site for future presidential memorials (perhaps solving a recurrent problem). A new kind of design control might be developed for this area to prevent "project inflation" of individual presidential memorials. At the same time, an underground garage in the center of the Ellipse could replace the lost street parking, and add some spaces for visitors. 4. HOW SHOULD WE MEASURE THE ENVIRONMENTAL HEALTH OF THE MALL? The workshop discussion of this question centered on the idea of environmental sustainability. Using this framework, we would explore the Malls capacity: how much activity can it sustain. There was a suggestion to study the Mall resources scientifically and set measurable standards for both physical space and ideology. To do this would require thinking about how we would like the Mall to function in future generations, and to set standards that would permit long term health. For example, one could measure the recovery rate from repeated users -- how much the soil and turf was being compacted. This approach could set the basis for future decision-making and avoiding fights by competing interests. It was noted that Congress is not looking to fill up the space, but rather for management guidance, and that this approach might prove to be a useful role for the Conservancy. It was agreed that security measures should be part of a master planning effort and not implemented as a separate action. 6. WHAT KIND OF MASTER PLAN SHOULD BE DEVELOPED? The discussion focused on the use of incremental policy changes regarding public uses rather than on major physical changes (such as the McMillan Plan used) to shape the future. These revised policies could become the core concepts for a new Master Plan for the Mall. 7. WHAT IS THE ROLE OF A CONSERVANCY? Involve citizens -- both local and nationwide -- in understanding the role of the National Mall in maintaining the health of our democracy.